There are many reasons to buy a custom entry door Houston. Custom doors are perfect for older homes, where the entryway is an odd shape. This style of door is also ideal for those who want to set their homes apart from others in the area. These doors are not as expensive as many consumers believe. They are often available at very reasonable prices; some comparable to pre-made options. The extra enjoyment you will receive from installing the door of your dreams is worth a slight increase in cost. Custom models are also perfect for people who want specific things from their front doors. For example, a fiberglass entry door with a large glass insert will let in light and keep out the cold. Coming to the conclusion that custom solutions are best is easy. Figuring out the details can be a bit trickier. The best place to start is to examine the base material itself. It is easy to add decorative touches to suit your tastes to almost any door. Learning more about popular materials can help you narrow down your choices. Customers across the U.S. and Canada can visit Southern Front at http://www.southernfront.com. Southern Front has a large selection of premade doors available. They are also happy to work with you to develop Houston-based exterior doors customized to your specifications. You can contact Southern Front by calling 281-890-5860 to speak with sales staff. Additional contact information, including email address, are online. After you learn a bit about base materials, contact Southern Front today. Are Fiberglass Entry Doors Right For Your Home? Fiberglass entry doors are the easiest material to customize. Manufacturers can stain them or paint then in a wide variety of colors and patterns. As a result, you can order a fiberglass door to look like real wood. You can also install one painted in a brilliant color or one that has an interesting pattern. It is also easier to repaint or re-stain fiberglass than it is to do the same to older types of wood. Homeowners who like to redecorate often should consider fiberglass. Another benefit of these types of doors is their durability. This type of material holds up well against day-to-day wear and tear. Scratches and dents are not as apparent on fiberglass as they are on wood. Most fiberglass doors have an insulated core, allowing them to insulate your home very well. In fact, some homeowners even report decreased energy costs after installing fiberglass. The only downside to this material is that it is slightly more expensive than wood. If you are thinking about ordering a custom fiberglass door, visit Southern Front today. They have many years of experience supplying beautiful front doors to customers across the country. Southern Front also offers a warranty on their products, giving you additional peace of mind. Prospective customers can visit them online at http://www.southernfront.com to learn more. You can also contact them by calling 281-890-5860. Do You Like The Look Of Custom French Doors In Houston? Custom French doors in Houston are also very popular choice for rear entry doors. One of the defining characteristics of this style of door is its large panes of glass. These panes are perfect for allowing sunlight in, but do not provide much privacy. For this reason, people who love the look of French doors often install them as a gateway to the backyard. Modern French doors also offer a surprising amount of security. Manufacturers use very thick glass and durable wood in construction. Some people may be put off by large panes of transparent glass. In some cases, you may want to have a bit more privacy separating your home from the backyard. If that is the case, custom doors are the perfect option for you. By specifying exactly how you want the door to look, you can achieve the level of privacy you need. You can opt for opaque glass, or glass with a decorative design. You may also want to choose a style with more wood than glass. Make a note of your priorities and bring them up when you speak with sales staff. Any reputable retailer will help you get the French door you want. Southern Front is the perfect place to go for all your custom French door needs. They have a wide selection of pre-made models and are happy to customize any option for your tastes. Visit them online at http://www.southernfront.com to learn more about their existing selection of doors. You can also contact them by calling 281-890-5860 and asking about custom options. Southern Front wants to be sure you are happy with your home. Having beautiful doors is a great start. Would You Prefer Wrought Iron Doors In Houston? Wrought iron doors in Houston are another popular choice. Wrought iron is a very sturdy and durable material. Doors made with wrought iron often raise a home’s value by quite a lot. They also add a lot of curb appeal to any home’s exterior. This material is also very easy to keep clean, and needs very little maintenance to last. Homeowners looking to add rustic touches to their home should consider wrought iron first. Some people may find that pre-made wrought iron looks too heavy or dark for their entryway. If that is the case, you can explore custom solutions. Manufacturers can design your door with as much or as little wrought iron as you want. Consumers who prefer wrought iron should spend some time looking at premade models. You can then make a list of the features you like and the ones you dislike. In the end, you will have a great place to start discussions when you contact a custom retailer. Southern Front is happy to be the preferred retailer for many homebuilders’ associations. They have years of experience providing custom doors to homes across the U.S. and Canada. You can visit them online at http://www.southernfront.com to learn more about custom models. Interested consumers can also call them at 281-890-5860. Custom doors are perfect for those who want something a little out of the ordinary for their homes. This style of door is also perfect for homes with older entryways or who have specific exterior door preferences. Finding the perfect Houston-based exterior door starts by figuring out which material is best. If you are thinking of custom options, do not hesitate to ask your local retailer questions about them. Southern Front is happy to speak with customers about their premade and custom door models. You can visit Southern Front online at http://www.southernfront.com. You can also contact them by calling 281-890-5860. 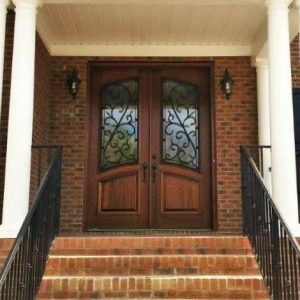 Southern Front should be your first stop when looking for the perfect custom entry door Houston.